When God gives you lemons, make lemonade. When God makes you push the wrong microphone setting on your recorder, make special bonus material for your podcast listeners. It's a rule I live by. So if you listened to the radio version of this conversation, you've only heard part of it. The intro, outro and half-hour in the middle are all brand spanking new for this podcast. Oh, I should mention who I'm talking to. It's Edmonton-based comic Sean Lecomber, a very funny guy. Not to be confused with another very funny guy, Shaun Majumder. He's also a super guest. He'll go anywhere and have something interesting or funny to say about it. Among the many topics we discuss in this 78-minute behemoth are his geopolitical cheese theory, North Korean Netflix, the possibility of throwing his comedy career away, play dates, rostering at an elementary school, being adopted, and smart audiences in England. Have a listen, here or elsewhere. This audio player below won't show up on your phone so then you'll have to do a search for What's So Funny? at iTunes or Stitcher or PodcastLand or Player.FM or TuneIn or... you get the idea. Tim Rykert joins the 5-timers' club with this appearance on What's So Funny? He joins the very special ranks of Ian Boothby, Steve Bays, Graham Clark, Dylan Rhymer, Will Davis, Harry Doupe, Richard Lett, Darcy Michael, and Kliph Nesteroff. Welcome, Tim. This podcast episode drops the week his web series, Who is Jimmy the Bag?, debuts. We spend the bulk of the hour talking about it. It's a good concept with endless story lines. Check it out. And check out our talk. Right here or on iTunes, Stitcher, PodcastLand... You know the drill. Go subscribe somewhere. This show's very first guests back in April of 2004 were Dana Alexander and Paul Bae. You'd think we were going alphabetically, but that was not the case. I'm not sure when Dana moved away first to Toronto and then to the U.K. but it couldn't have been much after that. Now here we are in 2014 and Dana's back with us. She just spent the weekend headlining Yuk Yuk's so we scooped her up to reminisce. We're on the air at 11 pm, exactly the same time slot as a decade ago. Different frequency, though, since we moved to 100.5 FM a year or so ago. You can livestream us in Edmonton, Toronto or London (or anywhere fine internet is found) at coopradio.org. It's always fun having Darcy Michael guest on the show. This marks his fifth appearance. Glad he still has time for the little people now that he's a big star. He's on a prime time network sitcom, afterall. Sure, it's Canadian, but it's still something. Michael stars as the lovable goof Gordon in CTV's Spun Out, which also stars Dave Foley. Darcy talks about all he's got on the go, from getting recognized on public transit, to doing standup, competitions, and opening for Russell Peters at Rogers Arena (aka GM Place to me). Listen to the episode right here, if you like. Or subscribe at iTunes and it'll just show up in your feed automatically. Or Stitcher, if that's how you roll. You've got options is all I'm saying. Tonight we've got Edmonton-based comic Sean Lecomber on for the first time. We had a great talk. What you'll hear on radio tonight will be different from what you'll hear when the podcast version drops. Why? Because I'm an incompetent doofus. The first half-hour of our conversation was recorded with a room mic rather than our hand-held ones. So that'll be the bonus material for the podcast. Tonight you'll just hear the 45 minutes we recorded after that with the good microphones, buttressed by an audio clip of Lecomber performing. We talk about kids, retiring from comedy, winning Just For Laughs' Homegrown Competition, being adopted, the myth of British audiences, and the Canadian Comedy Awards. Tune in tonight to CFRO 100.5 FM in Vancouver at 11 pm. Or livestream us at coopradio.org. It'll whet your appetite for the extendo version on podcast. Tim Rykert's back for another kick at the can. Like Darcy Michael last week, tonight will mark Rykert's fifth time on the show (although he shared two previous visits, one with Jamie Hutchinson and one with Will Davis). Tonight he's here to talk about some dude named Jimmy the Bag. I have so many questions, like what kind of bag? Dirt? Scum? Douche? Paper? Plastic? Actually, I think it's of the douche variety. Check out the trailer below. This is a web series he's been working on for a while. In what capacity, we'll find out. But the series stars former What's So Funny? guests Sam Easton, Damonde Tschritter, and Toby Hargrave. Maybe more. Tune in and find out tonight at 11 pm on CFRO 100.5 FM or livestream us at coopradio.org. Who is Jimmy the Bag? airs on your computer screens on Sept. 26 and runs for 26 episodes. In the meantime, check out all their teasers at jimmythebag.com. Thoroughly enjoyed my conversation with Denise Jones a week or so ago. She cleaned up. The Vancouver TheatreSports League vet talked about being King Herod in Jesus Christ Superstar, Taco Bell commercials she hasn't done, washing away her Kiss makeup with tears, her Newfie heritage, and doing improv on the high seas for months on end. Here's your link. If you don't like it, how about iTunes? Maybe Stitcher? PodcastLand perchance? It's everywhere! Tonight will mark Darcy Michael's fifth appearance on What's So Funny?, having done shows in 2006, 2007, 2009, and 2012. But this is his first as a big-shot TV star. Darcy still does standup (he's headlining the Comedy MIX Sept. 18 to 20, is in the finals for the XM Top Comic in Toronto, and is opening for Russell Peters at Rogers Arena on Sept. 27) but he's also one of the stars of CTV's Spun Out starring Dave Foley, which is coming back for a second season. So as you can see, we'll have lots to talk about. But even without all that, there's always tons to talk about with Darcy. Check us out at 11 pm PT on CFRO 100.5 FM or livestream us at coopradio.org. Got it? Garrett Clark (aka Gazzy) is a Canadian who sounds Australian. He has his reasons, which you'll learn if you listen to this episode. He's a standup comic now but at one time he was a squeaky-voiced teenager on TV. And then he was a flight attendant. Now he plays stages all over the Dominion of Canada and the United States of America. He also has his pilot's license, which terrifies me and my new manservant, Colleen. But he talks us through it. Hey, kids. 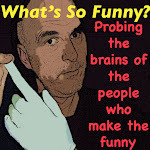 I've got a new episode of What's So Funny? for you right here. And it's a fun one. Infuriating if you've got somewhere to go, but fun nonetheless. It was the episode that never ended. Yes, it eventually ends, but you get the idea. If you make a drinking game out it and take a swig every time I try to draw it to a close, you'll be passed out before we get there. It was an interesting night. Usually when I record a remote interview, we go to a vacant club, or a hotel room, or a hotel conference room, or even my car. Calgary's Chris Gordon was eager to do the show, but didn't have a place where we could record. I met him after his show at the Comedy MIX. We hit the streets looking for a place and settled in across the street at the Wall Centre. We got the go-ahead from the front desk to sit in the lobby and do our chat. No sooner did we sit down and hit record than a live band piped up behind us. No worries. It's great ambience, even if the band over-used what we called a "dream machine" for lack of knowledge on its real name. Then halfway through a burly security guard approaches and tells us we're not permitted to record there for the obvious reason that, um... no reason. But we kept it rolling and strode out the revolving doors to the great outdoors, where we plopped down immediately to finish our conversation. Eventually. Here it is for you. Click below. If you don't see what I'm talking about, chances are you're on your phone. Get off your phone, get yourself to a computer, and you'll see it. Of course, you can always subscribe at iTunes or Stitcher or PodcastLand. If this particular episode isn't there yet, it will be very soon. And then there's Comedy Couch, which is where they're all housed and available for your inspection.